Politicians have said there are significant inaccuracies on the register. SINCE LAST MONTH’S referendum result, there have been calls by both Fianna Fáil and Fine Gael for the electoral register to get a “drastic revamp”. TheJournal.ie reported that one woman in Wicklow discovered that despite submitting all the relevant documentation, on time, in order to be added to the supplementary register, she was told she would not be able to vote. A letter from Wicklow County Council said the constituent would be unable to vote in the referendum due to an “administrative error”. Fianna Fáil’s Stephen Donnelly, who has been in contact with the woman impacted by the administrative error told TheJournal.ie that the actions of the council were totally unacceptable and “outrageous”. Donnelly said he would be bringing forward legislative changes to overhaul how the electoral register operates. Any change would have to be done ahead of the next general election, which some are tipping for early next year. Since the publication of the story, a number of other voters from other constituencies have said they experienced something similar. Fine Gael Senator Paul Coghlan has said a “drastic revamp” of Ireland’s electoral register is needed. “While there is absolutely no doubt at the certainty of the result of the recent referendum, it has once again highlighted the outdated and cumbersome nature of our Electoral Register. “People are forced through so many hoops to register. The process of having to download an RFA2 form to register or a RFA3 form to change address, then having to get it stamped by a Garda and then leaving it into a Council office is cumbersome and is actually creating a barrier for democratic participation,” he said. He said calls for the system to be overhauled have fallen on deaf ears, but he believes with the referendum fresh in people’s minds, now is a good time to introduce changes. “Before the 2016 General Election, a report endorsed by TDs and Senators of the Oireachtas Environment Committee found that at the last election, the Register of Electors contained almost half a million people more than it should have,” he said. Coughlan said there are “significant inaccuracies” on the electoral register “up and down the country”. This leaves the system vulnerable to inaccuracies, he added. The senator recommends Ireland follow the UK example and move to an online system. In the UK eligible voters can register to vote and change their address online. The process takes five minutes and all that is required is a social national insurance number. He said a suitable substitute could be a Public Services Card. Email “Calls to reform 'outdated and cumbersome' electoral register system”. 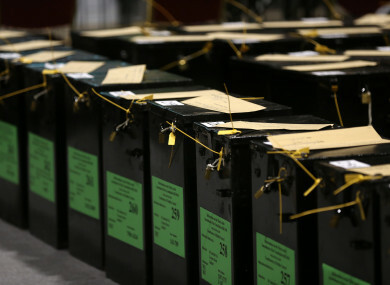 Feedback on “Calls to reform 'outdated and cumbersome' electoral register system”.